Had The United States not liberated South Korea from the North’s aggression 60 years ago during the Korean War, I would never have had the opportunity to sit here, contemplate about promoting freedom for others, and write this essay. In the early summer morning of mid June 1950, North Koreans, under the command of Kim-II- Sung, struck south of their border. South Korea was taken by surprise and because of weak defenses was helpless. Thousands of lives already were lost on both sides when the armistice was initiated in 1953. Ever since then, North Korea has fallen into utter isolationism while the South has become a free republic. Today, North Korea is decades behind the technology, when on the other hand, South Korea stands as world’s 12th strongest power. Most of us take our democratic society for granted because we never had to experience living in a polar opposite society, where we are deprived of our first amendment rights and freedom of choice to believe in what we want. When we watch news about countries that are ruled by dictatorship and through fear, it seems so distant from us because we can’t really relate it to our lives. In North Korea, there are 24 million people, approximately 3 times the population of New York City, suffering under a communist regime. Of those 24 million, there are over 200,000 people imprisoned in gulags. It is unbearable to picture how so many people, whether male or female, whether a child or an elder, would suffer from malnutrition, poor sanitation, hard labor and abuses and die without remorse. Unfortunately, most people do not have any idea what a life is like behind the tightly closed doors of North Korea. The North Koreans have no political rights whatsoever; there is no presidential election every 4 years. The Kim family, now down to the third generation, has been ruling for last 60 years. Human Rights have been extirpated and overshadowed by the totalitarian government. Something must be done to promote political rights and civil liberties for people in North Korea. There are things that we and the government can and should do to bring about even just a little change for North Koreans because every big change starts out small. There are parts of the solution that we, the people can undertake to advocate political rights and civil liberties for North Korea. First, we need to change our perception. North Korea was referred to as one of the “Axis of Evil” in President Bush’s State of Union address. The people of North Korea are often viewed as one big mass of evil. However, they are the ultimate victims of a terribly corrupt government. Therefore, we need to shift our focus to the civilians who are starving to death. Second, we need to bring awareness of what has been going on in North Korea to as many people as possible. In the 21st century where the technology has advanced beyond our belief, the internet has become a powerful tool that connects everyone from all over the world. Aside from looking at the debate about the true intention of the campaign, Kony 2012 was unrivaled in getting the message about a human rights problem out into the public. The group of individuals – not politicians, not scientists, celebrities, or billionaires – brought awareness to the world by the use of the internet. We can learn from this and exploit the internet to illuminate the truths and spread the news about the people of North Korea. The next step the U.S should take is to provide genuine truths and information to the people of North Korea. North Korea has been heavily guarded with massive propaganda for last 60 years. The people are fed lies and are totally oblivious to what is going on outside their borders. However, if we come into North Korea to distribute food, the Koreans will see that the U.S, a democratic and a capitalist society, is more prosperous and in fact, helping them out. This truth will be eventually understood by the people. On the flip side, there is no way North Korea will just let U.S. spread its capitalist and democratic ideals. This is why we need to be very subtle in planning things out so that we will do just enough to ignite the enlightenment in the people’s subconscious. If we do it right the people will realize that something is wrong with their society and their leader. Their hearts will be kindled with desire to gain freedom in their corrupted world. Even though I am sure that bringing about civil liberty and political rights will be impossibly hard and frustrating, I know that something must be done to solve the situation. Everyone can contribute to bring change by spreading the words about the situations in North Korea. The United States should put efforts and make subtle plans to encourage the people of North Korea to eventually beginning a revolution to overthrow evil and corruption. 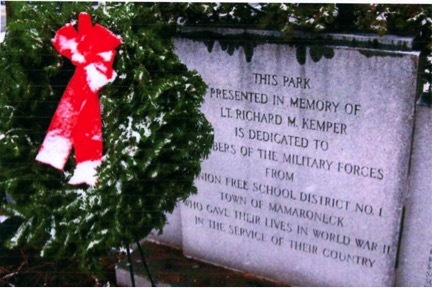 As my grandmother, Renee, and I head towards the entrance of Mamaroneck High School, her eyes catch a glimpse of the Kemper Memorial. Without hesitation she changes direction and stops right in front of the monument’s center. I watch her as the muscles of her face tighten and a tear glides down her cheek. Her connection to the names inscribed in the stone feels magnetic, and so strong that I can sense the pull. I notice her lips mouthing the names of each individual, as she honors those who passed in World War II. After vigilantly reciting the veterans’ names, she cranes her neck to face me. Without uttering a word, she transfers the stories of her past. They’re written in the creases of her forehead, each wrinkle representing another emotion that shook her world during the war. I was transported to the village of Grenade, France, where I could see her young and vulnerable at the age of seven, standing in the middle of the street with Yvonne, her older sister. Yvonne restrained her while she yelped and cried, as her parents were loaded into a truck to be deported. No one knew exactly where her parents, who were Jewish, would end up; all they could do was hope. Hidden in a Catholic convent for young girls, Renee and Yvonne were protected from the Nazis. Their parents were both sent to concentration camps and forced to endure the atrocities that haunt our world today. Thankfully my grandmother was never physically hurt during the Holocaust, but her mental health has been greatly affected by the numerous traumatic experiences. A moment later, I am again staring into my grandmother’s pained eyes as they remain fixed on the memorial. While the lines in her face dismay me, I know there is a sense of hope as her eyes brighten and her lips ripen into a smile. As I turn to the Kemper Memorial, I don’t just see an array of names anymore. An overwhelming desire to honor these veterans comes over me, for their bravery, strength, and the pain they endured. Within the crevasses of this stone, many memories and stories are protected. Even though I’m able to see the memorial from her perspective, it is important that I interpret it in my own way. We live everyday because these veterans fought for us. It is crucial that our generation honor them and the comrades who carry on their legacy today. I believe one of the most important ways that people today can honor our country’s veterans is by sharing their stories and educating students about what they fought for. It is the choice of the veterans’ families to tell the stories, but it is our responsibility to listen. Renee and Yvonne have spent many years recording and expressing their past memories. I’ve heard them present their stories to their family, schools, or even the person sitting next to them on the bus. People are more emotionally affected when they hear the personal accounts of hardships faced by veterans or survivors. By knowing specifics stories, the sacrifices of many others come alive with greater reality. In school, when students learn about wars, they hear about major battles and peace agreements, but in order to remember those brave men and women who sacrificed their lives, kids must be taught personal stories of veterans. Telling a specific veteran’s story can create a more intimate connection, making students aware of what they fought for. Each of the heroes inscribed in the Kemper Memorial has a story to be heard. My grandmother, mother, and I would not be here today if it weren’t for these and so many other brave American soldiers. Grandma Renee claims to be forever grateful because of the sacrifices made to save innocent people like herself. The soldiers who fought for the lives of others deserve to be remembered. With the patience of our generation and the cooperation of those who hold their stories, our veterans’ legacies can live on. The aftermath of the Second Chechen War fought between The Russian Federation and the Chechen Republic of Ichkeria brought about some of the most significant free speech violations in Russia’s recent history. Although the conflict lasted between 1994 and 1996, journalists and human rights activists remember it for Anna Politkovskaya’s unsolved 2006 murder. Politkovskaya, a prominent Russian journalist, dared to write about the truth behind the Second Chechen War and was consequentially killed outside of her Moscow apartment in October of 2006. Her case became the embodiment for journalistic rights activists all over the world. Non-governmental organizations such as Human Rights Watch and Reporters Without Borders pressure the Russian government into reforming press rights through mass-media exposure and conversing directly with political leaders. Oppression of the press in Russia is a direct violation of Article 19 of the Universal Declaration of Human Rights; the Russian government is aware of this violation and is in the process of reforming its policy that is responsible for violence against journalists and media companies. Non-governmental agencies like Reporters Without Borders and Human Rights Watch work to expose these crimes against journalists to the international community, thus pressuring the Russian government to provide a safe working environment for them through new policies. Russia is in clear violation of basic human rights. The Russian authorities are infringing upon journalists’ right to hold and express opinions different from the Kremlin’s. In order to have free press, human rights need to be imposed on Russian society. According to the Universal Declaration of Human Rights, “everyone has the right to freedom of opinion and expression; this right includes freedom to hold opinions without interference and to seek, receive and impart information and ideas through any media and regardless of frontiers” (United Nations). The number of journalists and media assistants killed is alarming in Russia. 52 journalists were killed with motive confirmed in the last 8 years, landing Russia a spot on the list of worst places to be a journalist (Committee to Protect Journalists). 62% of the deaths were murders, while only 23% of journalists died in crossfire or combat of the 52 killed (Committee to Protect Journalists). The key to solving this human rights problem is establishing a true democracy because “no society freely chooses to limit speech or the right of association”, argues Jason Mark of globalexchange.org. To create a free reporting environment, “the will of the people [should] be the basis of the authority of the government” (United Nations). Russian authorities can persecute the press legally based on vague legislation. These muzzy laws give the authorities legal power to harass journalists. In the volatile Caucasus region, the government combats terrorism with “anti-extremist legislation” that can persecute everyday citizens (including media workers) suspected of engaging in terrorist activity (RIA Novosti). The law applies to every region in Russia and to even the smallest of actions such as interviewing a rebel leader not supported by the Russian state. The consequences can include the police searching a media company’s offices, seizing files, and threatening to shut down the company (RIA Novosti). In addition to harming a media company’s image, the government abuses its power by search a journalist’s home and detaining his files (RIA Novosti). Russia is infamous for journalists’ murders right after publishing controversial content. Some of these “mysterious” deaths happened to Natalia Estemirova, Anna Politkovskaya, Telman (Abdulla) Alishayev, Anastasia Baburova, and Olga Kotovskaya (Committee to Protect Journalists). The majority of the victims used to report on topics like politics, war, and corruption (Committee to Protect Journalists). It is no coincidence that journalists who challenged the state were attacked: the government condemns “hostile attitude[s] toward[s] law enforcement agencies” (Reporters Without Borders). This means that an article or broadcast that so much as “defame[s] [a] political leader” is not in compliance with the law (Reporters Without Borders). The fact that the state allowed an unusual number of these attacks on its own citizens to go unpunished is an embarrassment to democratic nations worldwide: something must be done about this situation in Russia. Non-governmental organizations (NGOs) use diplomatic routes and mass media to pressure Russia into reforming its strict policies toward treatment of its journalists as well as gather and publish their finding in reports for the public to see. Since the organizations are non-governmental, they lack the factor of national interest, thus they focus more on the issues at hand. Although non-governmental organizations do not have legal power and run solely on donations and grants, they still have a powerful voice in combating oppression of journalists. Human Rights Watch is an NGO committed to protecting human rights by “preventing discrimination, upholding political freedom, protect[ing] people from inhumane conduct in wartime, and bring[ing] offenders to justice” (Human Rights Watch). This organization criticizes the Russian government for allowing Anna Politkovskaya’s murder to go unsolved. Anna Politkovskaya, a prominent journalist for Novaya Gazeta, was murdered in Moscow in October of 2006. She documented torture and other abuses during the Second Chechnya War (Lokshina). She was one of the few who “travelled to the region… wrote about such burning issues, took such tremendous risks, that after a while many of us thought that she had managed to transcend danger” in Chechnya (Lokshina). The acquittals of the three men accused of the murder “highlight a culture of impunity that must be brought to an end” (Lokshina). Politkovskaya’s case brought media and political attention to the fact that Russians “who dare criticize the government can be killed, with their killers practically guaranteed impunity” (Lokshina). Can the offenders get away with these crimes? The answer is yes; therefore, non-governmental organizations prove useful in situations where the government holds problematic views on freedom of speech. Reporters Without Borders’ work to alert the international community about Russia’s human rights violations brought about favorable outcomes. Working with the United Nations as consultant, Reporters Without Borders publicizes the results of its fact-finding missions to Russia (Reporters Without Borders). The situation in the Caucasus region is unstable and dangerous, especially to a journalist. The report reveals, “the media and the civil society representatives who defend free expression are subject to a great deal of harassment” (Reporters Without Borders). Consequentially, “civil society and independent media are in danger of being abandoned to their day-to-day violence with no one taking notice” (Reporters Without Borders). In response to this, Reporters Without Borders publishes an annual report called the Press Freedom Index that measures the degree of freedom that journalists and new organizations in a specific country have and to which degree the authorities respect this right (Reporters Without Borders). With Russia ranked 140th of 178 on the Index, it is one of the most volatile places for media workers (Reporters Without Borders). The steps this organization has taken proves to be useful. In reaction to the current condition in Russia, Reporters Without Borders “urge[d] Europe’s leaders to remind their Russian counterparts that the international community expects these murders to be solved” (Reporters Without Borders). The international community did indeed react with outrage and demanded reform on Russia’s behalf. The European Court of Human Rights was established in 1959 to enforce the European Convention on Human Rights (European Court of Human Rights). Similar to the UDHR, the European Convention on Human Rights is a list of articles that secure and defend human freedoms, however, the document was also signed by the Council of Europe, an organization of 47 countries that includes Russia (European Court of Human Rights). Unlike the UDHR, the Convention has legal authority in prosecuting governments as it is a “powerful living instrument for meeting new challenges and consolidating the rule of law and democracy in Europe” (European Court of Human Rights). On November of 2006 at the European Union’s Helsinki Summit, Russia was reminded of Politkovskaya’s murder and was pressured both politically and economically into improving its freedom of speech rights. As a signatory of the Convention, “Russia has an explicit undertaking to respect and protect human rights” (Reporters Without Borders). Because “all final judgments of the European Court of Human Rights are binding on the State involved,” Russia is under great pressure to amend its policies (European Court of Human Rights). Dmitry Medvedvev’s summoning of officers from Human Rights Watch to discuss human rights issues at the Kremlin after much persuasion from the global community brought about promises in improving the safety of journalists and NGO employees working in Russia. Human rights activists and reporters raised questions regarding abuses by law enforcement and security agencies, kidnappings, disappearances, and murders of journalists and activists like Politkovskaya, Markelov, and Estemirova (Lokshina). Medvedvev started off by stating, “bodies of power at all levels should be in constant dialogue with non-governmental organizations” and also acknowledged “the staffing decisions that [he] has made in this regard… were connected… with the fact that… the position of heads of republics of the Federation in the North Caucasus lost contact with various civic bodies” (Lokshina). Although the president appears to be making progress to improve relations between NGOs and the government, Anna Sevortian, HRW’s Russia office director does not believe he is. She says that although “the Kremlin’s upbeat talk about human rights has improved Russia’s international standing, the human rights climate in Russia remains very hostile” (Human Rights Watch). Tension still remains between law enforcement agencies and news organizations presently. For example, Nadira Isayeva continues to fight for free press while reporting “on [the government’s] handling of violence and militant Islam in the region [of Dagestan]” (Committee to Protect Journalists). The Committee to Protect Journalists (CPJ) presented Nadira Isayeva, Editor in Chief of the independent newspaper, Chernovik, with a Press Freedom Award on November 24, 2010 (Committee to Protect Journalists). Using anti-extremist legislation, the authorities “brought a criminal case against her… after she published an interview with a former guerrilla leader, who accused local authorities of corruption and of being in thrall to the Kremlin (Committee to Protect Journalists). She is known to be “counter-productive [of] the heavy-handed tactics of state agencies charged with fighting terrorism” (Committee to Protect Journalists). “Disabled Editor Found Guilty of Defaming Mayor.” Reporters Sans Frontières. 10 Nov. 2010. Web. 16 Nov. 2010. .Mikhail Beketov, a newspaper editor, has been recently been on trial for defaming the mayor, Vladimir Strelchenko, after accusing him of “political terror”. He was left mentally and physically disabled from an attack outside his home in Khimiki. The police dismissed his case without making an arrest. He isn’t allowed to leave the country until his trial is over. This poses a problem because he needs to seek medical treatment in another country. “Elena Milashina, Russia | Human Rights Watch.” Human Rights Watch. 1 Oct. 2009. Web. 22 Nov. 2010. <http://www.hrw.org/en/news/2009/10/01/elena-milashina-russia>. “European Court on Human Rights.” European Court on Human Rights. Web. 5 Dec. 2010. <http://www.echr.coe.int/NR/rdonlyres/DF074FE4-96C2-4384-BFF6-404AAF5BC585/0/Brochure_EN_Portes_ouvertes.pdf>. “Helsinki Summit: Europe Urged to Remind Russia of Its Human Rights Commitments.” Reporters Sans Frontières. 24 Nov. 2006. Web. 16 Nov. 2010. <http://en.rsf.org/belarus-helsinki-summit-europe-urged-to-24-11-2006,19887.html>. EU reminds Russia at Helsinki summit that it must uphold human rights within its boarders. The discussions revolved around the murder of Anna Politkovskaya. Since Russia is a signatory of European Convention on Human Rights, the international community expects Russia to uphold its end of the deal. “Introduction.” Reporters Sans Frontières. 24 Apr. 2009. Web. 21 Nov. 2010. <http://en.rsf.org/introduction-24-04-2009,32617.html>. Reporters Without Borders works to protect the rights of journalists all over the world. It fights laws for censorship and laws that undermine press freedom. It is registered NGO in France as well as a consultant in the United Nations. RWB works to improve safety of journalists in war zones. Lokshina, Tanya. “Anna Politkovskaya: No Justice.” Human Rights Watch. 20 Feb. 2009. Web. 04 Nov. 2010. <http://www.hrw.org/en/news/2009/02/20/anna-politkovskaya-no-justice>. Anna Politkovskaya was killed for reporting on the truth behind the second Chechen War in Russia. The three suspected men who were said to have been her killers were acquitted, thus leaving her real murderers at large in Russia. This sent a message out that killings related to journalists were “forgotten” by the Russian government. Lokshina, Tanya. “President Medvedev Summons Russia’s Human Rights Workers | Human Rights Watch.” Human Rights Watch. 3 June 2010. Web. 21 Nov. 2010. <http://www.hrw.org/en/news/2010/06/03/president-medvedvev-summons-russia-s-human-rights-workers>. Tanya Lokshina analyzes a recent meeting between Russia’s president, Dmitry Medvedev, and human rights activists. The goal of the meeting was to place emphasis on the relationship between NGOs and the Russian government, especially in the Caucasus, where a lot of unrest between civilians and state officials occurs. Mark, Jason. “A New Definition of Human Rights.” Global Exchange – Building People-to-People Ties. Jan. 2001. Web. 30 Nov. 2010. <http://www.globalexchange.org/about/newhumanrights.html>. “Nadira Isayeva, Russia – Awards – Committee to Protect Journalists.” Press Freedom Online – Committee to Protect Journalists. Web. 27 Nov. 2010. <http://www.hrw.org/en/news/2010/10/15/russia-sarkozy-merkel-should-raise-rights-issues-medvedev>. Human Rights Watch calls on leaders of France and Germany to intervene in the human rights condition in Russia. “The Universal Declaration of Human Rights.” The Universal Declaration of Human Rights. The United Nations. Web. 22 Nov. 2010. <http://www.un.org/en/documents/udhr/index.shtml#a19>. As stated by U.S. Rep. John Conyers, “Since September 11, our nation has engaged in a policy of institutionalized racial and ethnic profiling… If Dr. Martin Luther King Jr. were alive today…he would tell us we must not allow the horrific acts of terror our nation has endured to slowly and subversively destroy the foundation of our democracy.”(ACLU2, 11). Despite the civil rights movements in the United States in the 1950s and 1960s, discrimination and racism towards minorities is still prevalent, particularly in racial profiling. Law enforcement officials and other citizens have partaken in this act of suspecting individuals as criminals due to race, ethnicity, religion, or country of origin. Despite many efforts to prevent racial profiling in the United States by the federal government and each of the fifty states, it continues to sweep the nation. Racial profiling is a major human rights violation occurring in the United States, affecting millions of people of diverse nationalities, ethnicities, and religions. Resolving this immense issue is a difficult task. Racial profiling is best defined as the targeting of individuals and groups by law enforcement officials on the basis of race, ethnicity, national origin, or religion. On many occasions, individuals associated with law enforcement, who are said “to protect and to serve,” have used racial profiling when attempting to locate individuals breaking the law. For example, race has been used as a factor to determine which drivers to stop for minor traffic violations (referred to as “driving while black or brown”). It has also been used to determine which pedestrians to search for illegal contraband (ACLU1, 1). These and other acts have affected people such as: Native-Americans, Asians, Europeans, Hispanics, African-Americans, and Muslims. These acts of discrimination date back to the civil rights movement, and many believe they are a result of the war on drugs and the war on terror. Due to events such as the attacks on September 11 and many drug related crimes, Americans have much suspicion towards foreigners and they feel a lack of security. Many stereotypes have fueled law enforcement to harass and discriminate against specific ethnic groups. With stereotypes such as all terrorists are Muslim, all criminals who are drug dealers are African-American, and all illegal immigrants are Hispanic, about thirty two million people have been victims of racial profiling. As law enforcement officials specifically concentrate on searching and interrogating African-Americans, Hispanics, and those who look Muslim, their sights are taken away from capturing the real criminals. What makes racial profiling a human rights violation is that it violates many international treaties that the United States has signed related to discrimination and the promotion of racial equality. Such agreements include the International Convention on the Elimination of All Forms of Racial Discrimination (ICERD) and the International Covenant on Civil and Political Rights (ICCPR). The ICERD states that “human beings are born free and equal in dignity and rights and that everyone is entitled to all the rights and freedoms set out therein, without distinction of any kind, in particular as to race, colour or national origin.”(UN High Commissioner for Human Rights, 1) Similarly, the ICCPR directs all member countries to promote and respect civil and political freedoms, like freedom of religion, freedom of speech, and the right to a fair trail. Racial profiling is in violation of each of these treaties. The Declaration of Independence states that “all men are created equal,” however acts of racial profiling demonstrate that not all citizens are treated equally. A great number of people have had their rights taken away by the police, who interrogate them simply because of the color of their skin or their name. This practice not only violates the United States’ constitutional commitment of equality before the law, but it also violates the country’s international obligations to eliminate racism and racial discrimination. Often times racial profiling by police officers has led to searches of cars, individuals, or homes for drugs and weapons. When these searches do not provide any evidence for police officers to arrest individuals, traffic tickets or warnings have been given. Sometimes these searches have resulted in brutal beatings, humiliation, and violent protests towards the police. Sadly, racial profiling has led police to take the lives of innocent, young people. In various cases, police officers have shot and killed African-American or Hispanic males as they were wrongfully suspected of being criminals or carrying a weapon. Such instances have occurred when police see a minority driving an expensive car, wearing nice clothes, or “in the wrong neighborhood.” Ignorance, and jealousy, is the cause of most racial profiling. In 2009, one of the biggest Bollywood movie stars, Shahrukh Khan, came face to face with the unfair treatment towards minorities in the United States. Khan was taken by security guards in Newark Airport, and interrogated for almost two hours because of his Muslim name. The former President of India Abdul Kalam, Nobel laureate Amartya Sen, and countless other travelers have endured such treatment in airports as well. (Bhatnagar, 1) Law enforcement officials do not have specific reasons to single out certain people other than their assumptions that skin color, culture, religion, nationality, or last name is an indication of criminal intent. It is difficult to find resolutions for racial profiling. A U.N. reporter once stated, “Racism and racial discrimination have profoundly and lastingly marked and structured American society. The United States has made decisive progress…however, the historical, cultural and human depth of racism still permeates all dimensions of life of American society.”(ACLU2, 10). The United States government has been passing legislation for years to help put an end to racial profiling. The Obama administration has been working on passing a racial profiling act to send a strong message that the United States believes that people should not be scrutinized by law enforcement simply because of their last name, their faith, or their racial, ethnic or national origin. The government needs to create more programs, organizations, and local activities to promote equal treatment for all. Educating people, specifically children, will help people begin to understand that there is a need to start treating each other equally in spite of differences. Even with legislation and education, the racial profiling issue will not be resolved unless changes are made in law enforcement. Law enforcement officials have to be trained so that their duty is to protect every American no matter what they look like. Police officers need to be tested to see whether they are biased, racist, or have any hatred of particular ethnic or religious groups, or nationalities. Those who partake in racial profiling need to be punished; mere slaps on the wrist will not help the problem. Throughout the United Sates, the issue of racial profiling is a serious human rights concern that needs to be addressed. The United States is a fusion of many different ethnic groups and religions who have been affected by the discriminating methods of law enforcement. Seen as criminals or terrorists because of their name or the way that they look, racial profiling has swept the nation in the past several years. With changes in law enforcement, and an increase in government action, the issue of racial profiling can eventually be put to an end. 1. ACLU1, “Racial Profiling: Definition .” Because Freedom Can’t Protect Itself. ACLU, 23 Nov 2005. Web. 12 Apr 2011. <http://www.aclu.org/racial-justice/racial-profiling-definition>. 2. ACLU2, “The Persistence Of Racial And Ethnic Profiling In The United States .” Because Freedom Can. ACLU, 29 Jun 2009. Web. 12 Apr 2011. <http://www.aclu.org/files/pdfs/humanrights/cerd_finalreport.pdf>. 3. Amnesty International USA, “The Truth About Racial Profiling: Seven Facts.” Racial Profiling. Amnesty International USA, 2007. Web. 12 Apr 2011. <http://www.amnestyusa.org/racial_profiling/sevenfacts.html>. 4. Bhatnagar, Chandra S. “Commentary: Time for America to ban racial profiling.” CNN US. CNN, 31 Aug 2009. Web. 12 Apr 2011. <http://articles.cnn.com/2009-08-31/us/bhatnagar.khan_1_profiling-racial-muslim?_s=PM:US>. 5. UN High Commissioner for Human Rights, “International Convention on the Elimination of All Forms of Racial Discrimination.” OHCHR, 2007. Web. 12 Apr 2011. <http://www2.ohchr.org/english/law/cerd.htm>. Patriotism: noun. \pā-trē-ə-ˌti-zəm, love for or devotion to one’s country. Until this year, that is exactly what patriotism was to me: a definition. It was something I had learned about in Global History, and that I had heard expressed through song, but never something I completely understood or felt. In all honesty, until this year, I was never distinctly “proud to be an American.” However, recently, something changed, something that would forever alter my emotional response to the word “American.” Learning American History in depth for the first time has had a profound effect on me as a student, as a person, as an American. Now, I truly believe that learning and knowing and embracing the United States’ collective history sparks sincere American pride. I’m sitting in class on the first day of school. I’m nervous to begin my first AP course, and I’m skeptical that the class material will hold my interest all year. I am handed a syllabus. I skim through all of the events (listed chronologically) that we will learn about, and am surprised at how unfamiliar I am with the majority of the information on the page. I leave the room shaking, aware that regardless of whether or not I enjoy learning American History, this will be an intense and demanding class. Week 1: The American Revolution. For the first time, I am proud to be American. I am thrilled to be a product of the ideals that crafted our country’s independence. I am amazed that the colonists put such emphasis on democracy and representation. I am excited by the prospect that this is how the United State came into existence, and I want to keep learning. Week 3: Slavery. I am angered. I am offended that Americans could ever have supported and relied on such an awful institution. I am confused, and I wonder if the ideals of the American Revolution were for naught. I am eager to see how the establishment will transform and eventually dissolve. Week 7: Civil War. Abraham Lincoln’s speeches give me the shivers and I’m inspired by his determination. I learn that he’s not truly an extreme abolitionist, and I struggle to understand why that’s the case. I feel victorious when the Union dominates, and I truly hope that the country will be able to join back together peacefully. Week 9: Reconstruction. “A splendid failure,” we learn. An accurate description, I think, for a time when African Americans were given important roles in the government for the first time, only to be replaced by literacy poll tests for African Americans and other Jim Crow laws. I wonder, what took so long? Why was the concept of equality so foreign to average Americans? And what is taking so long now to end discrimination against other minority groups? Week 12: The Great Depression. The stock market crashes and jobs are scarce. Average people must go to great lengths merely to support their families. I sympathize with these Americans who put their faith in the bank, just like my own parents do today. I’m impressed, later, by FDR’s New Deal and “Alphabet Soup” programs. I wonder if something like his program to create jobs that also benefit infrastructure could be implemented currently in urban areas. Week 15: Civil Rights Movement. I am both frightened and touched by the lack of progress and the extreme development that the government has established for African Americans. The passing of the Voting Rights Act of 1965 makes me want to take action today. After hearing about thousands of African Americans in Tennessee that walked 54 miles to their local governor, I understand what it really means to be devoted to one’s country, to be patriotic. 2011. Don’t Ask Don’t Tell repealed. National Healthcare Bill passed. After weeks upon weeks of learning American History with 23 other students I’ve learned what it means to be patriotic, and I’ve figured out what drives this patriotism in Americans. The shared history of our people brings patriotism alive. It keeps us going, reminds us that there is a reason to fight for equal rights for everyone today. After learning American History, I know the feeling of squirming in my seat, nervous to find out the outcome of a certain war or debate. I know the feeling of wanting to take action, of being inspired by reformers like Robert La Follette and Martin Luther King. I understand patriotism, and I am proud to be an American. I am proud to carry on the legacy of the soldiers who fought to gain independence in the American Revolution. By the same token, I am not proud of everything that takes place in America today. I am not a proponent of the ban on gay marriage, nor do I feel that continued racism deserves any place in our society. However, it is U.S. history that has taught me that it is okay to be patriotic, despite these matters, because being American means taking action, marching on Washington, discussing, and yearning to bring about progressive and positive change. Today, I am patriotic, as are countless other Americans, because of the history that ties us all together, the history that allows us to believe in the power of the people, the history that causes us to stand up and voice the truth. I am connected to America because of its rich history, and, therefore, hope to be a part of shaping its future.